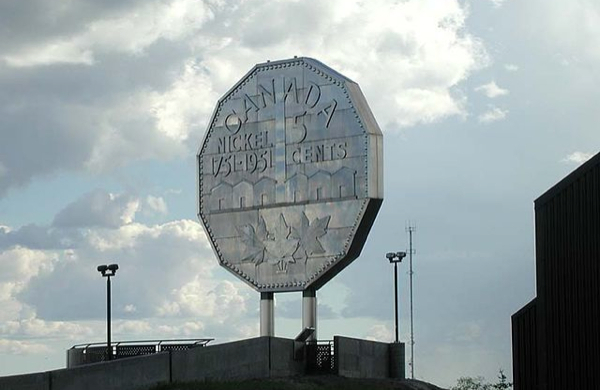 The “Big Nickel,” a nine-metre replica of a Canadian coin made with Vale's produced metal, located in Sudbury, Ontario. Der jüngste Ausverkauf im Goldminen- und Junior-Sektor zieht weite Kreise nach sich. IDM Mining trotzt mit starken Fundamental-Daten und einem ansprechenden Ausblick. Die kanadische Junior-Firma IDM Mining (TSX:IDM), welche sich auf die Exploration und die Entwicklung hochgradiger Goldprojekte in British Columbia spezialisiert hat, wird vom anhaltenden Sell-Off in der Goldminen-Branche in den letzten Wochen ebenfalls schwer getroffen. Und das komplett ohne rationale Gründe in Form von bspw. schlechten Firmennews. Der sektorweite Sell-Off sorgt für eine wahre Liquidationswelle, die erneut vor allem die Junioraktien besonders schwer erwischt. Sogar im Gegenteil. IDM Mining hat in diesem enorm anspruchsvollen Umfeld erfolgreich eine ordentliche Finanzierung in Höhe von knapp 2,5 Mio. CAD gestemmt - und das zu einem definitiv beachtlichen Aktienkurs von 0,40 CAD. 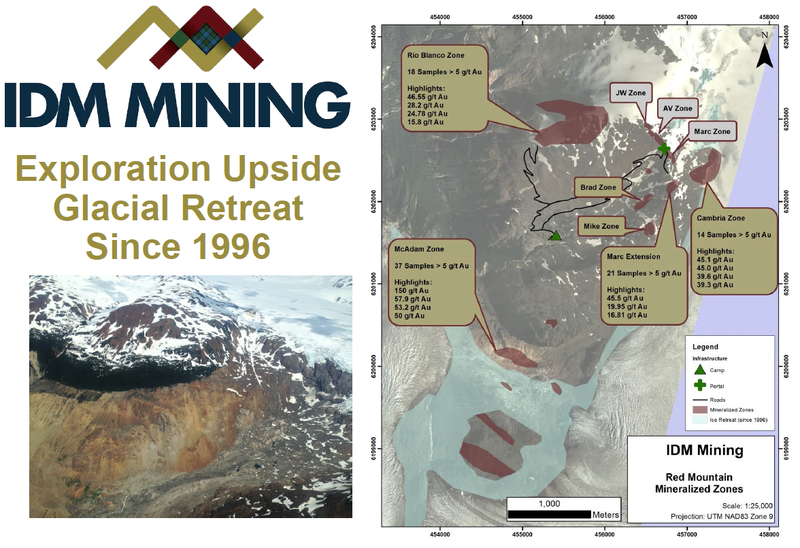 Oct 10, 2014 - IDM Mining Closes Second Tranche of Equity Financing to Fund Exploration at the Red Mountain Gold Project, B.C. Es gleicht einer Satire, wenn man sich hierzu den aktuellen Aktienkurs anschaut, der mehr als 55% unter dem jüngsten Finanzierungslevel notiert. So ergeben sich in jedem Fall exzellente Potentiale auf eine signifikante Turnaround-Rally, sobald sich der Ausverkauf im Sektor abschwächt und wenn IDM weitere gute Neuigkeiten von den laufenden Arbeitsprogrammen vorlegt. Und die Chancen hierfür stehen ausgesprochen gut. Die Firma steht vor einem wahrhaftig heißen Herbst und Winter, wenn man sich die anstehenden Prozesse und Kurskatalysten anschaut. Es werden einige bedeutende Fortschritte und Firmen-News erwartet, die positive Kursimpulse nach sich ziehen sollten. Gestern ist die renommierte US-Konferenz gestartet und steht im Hinblick auf die Marktlage in der Minen- und vor allem Edelmetall-Branche erneut unter einem sehr schlechten Stern - wie schon letztes Jahr. Hier der Link zu den Gesellschaften, die an der New Orleons Investment Conference teilnehmen. For four decades, there's been only one sure thing in investing: The New Orleans Investment Conference. Today's investing environment — as governments attempt to float their economies into recovery on oceans of new currency — is undoubtedly one of the riskiest and potentially profitable periods in history. Inflationary consequences are inevitable, and investors who sit idly by will watch their hard-earned wealth relentlessly eaten away. But those who prepare — who use the powerful strategies and investments that the New Orleans Conference has unfailingly provided during times such as this — will enjoy the greatest financial opportunities of their lifetimes. And that's why we're building another value-packed agenda for New Orleans 2014 — our blockbuster 40th Anniversary event — with dozens of the world’s top experts to address every one of the crucial problems, risks and opportunities facing investors today. ...Plus a lively panel discussion on gold, money, the economy and the role of the Fed with Dr. Marc Faber and Porter Stansberry. And our agenda will continue to build all year long, as many of the world’s most celebrated authorities in geopolitics, economics and investments sign up to present at our gala 40th Anniversary event! ð „Noch nicht einmal angefangen“ ist natürlich nicht ganz korrekt. Die Schweizer Kollegen sind bereits durchaus rührig - und es wird in den kommenden Wochen eine Reihe weiterer Kampagnen-Veranstaltungen geben. ð Aber ja: der schweizer Mainstream hält mit geballter, gleichgeschalteter Medienmacht auf intellektuell niedrigstem aber leider wegen der Massenberichte doch einflussreichem Niveau übermächtig dagegen. Umso beeindruckender das o.g. Zwischenergebnis (das ich kaum für möglich gehalten hätte). PS: So wichtig das Schweizer Referendum aus den auch von uns auf dem KOPP-Konferenz-Podium https://www.youtube.com/watch?v=Oj0lgVnnHUY genannten Gründen auch ist: Rein quantitativ verblasst all das angesichts des chinesischen Goldhungers: die Chinesen scheren sich nicht um die europäischen Kämpfe der Bürger gegen die Zentralbanken. Sie KAUFEN EINFACH. En masse: 2013 waren es bereits 2200 Tonnen (!) – also das Doppelte der bei der SNB im Feuer stehenden Goldmenge! 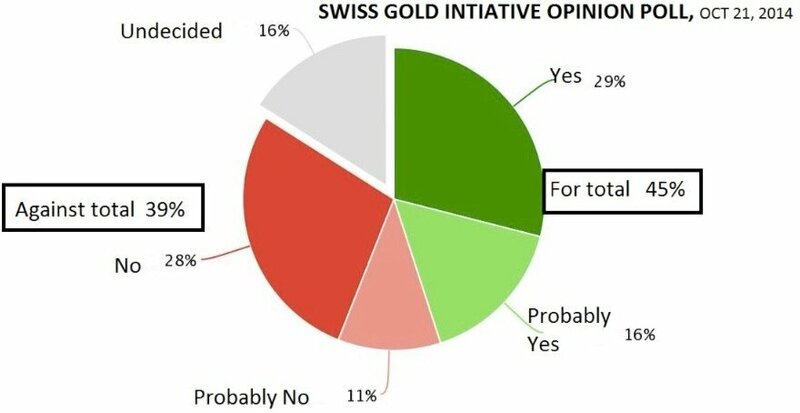 https://www.bullionstar.com/blog/koos-jansen/china-gold-association-2013-gold-demand-2199t/"
The first opinion poll regarding the Swiss gold referendum suggests the ‘Yes’ campaign has started in the lead. The first Swiss opinion poll regarding the country’s gold referendum, which takes place at the end of November, will have struck fear into the country’s establishment, giving those in favour of the changes a lead. The poll was taken before the Yes campaign has even presented its case to the people in any detail, which it will do in a press conference tomorrow. The establishment, on the other hand, is totally against the proposal, saying that the passing of the referendum would stifle the future financial management options of the country’s economic policy makers. The poll proposal was started by Swiss People's Party MP Luzi Stamm and two other MPs, with the 100,000 signatures required for a referendum obtained by early 2013. TheSwiss People’s party is described as a national conservative and right-wing populist political party and is the largest party in the Federal Assembly, with 54 members of the National Council and 5 of the Council of States. The key points to be put forward in the referendum proposals include repatriation of foreign held Swiss gold, a moratorium on selling future gold holdings and perhaps most significantly to purchase sufficient gold to bring the precious metal held up to 20% of the country’s gold and currency reserves from the current 7.7%. This latter aim would involve, according to the writer’s calculations, the purchase of nearly 1,650 tonnes of gold to bring the nation’s holdings to around 2,700 tonnes, which would put it in third place amongst the world’s gold holding nations. It is suggested that such a purchase programme could put a rocket under the gold price, even if phased in over several years. There is obviously plenty of time left for the Swiss elite to try and put their case across but, as was seen in the runup to the Scottish independence referendum, if they don’t play the media right they could help the anti-establishment cause, rather than turn things around in their favour. In Scotland, the Yes vote for independence gained momentum according to the polls throughout the campaign, and the more that the establishment spelt out what they saw as the disadvantages of independence (the ‘No’ campaign) the stronger the ‘Yes’ campaign performed. In the event the Yes campaign failed but the difference here is that it was coming from a long way behind, while in Switzerland it seems that its ‘Yes’ campaign may be starting as the front runner. Switzerland makes a fair number of key political decisions via the referendum process, but in most cases the status quo prevails and it had been assumed that the gold referendum would follow this pattern. This opinion poll really sets the cat among the pigeons. According to a blog report on Mark O’Byrne’s goldcore.com site the opinion poll cited was by the largest circulation newspaper in the country 20 Minuten – a morning free sheet. And the newspaper says that the poll was firstly a large one as opinion polls go with a sample of over 13,000 people and that it was organised by political scientists Lucas Leeman and Fabio Wasserfallen according to demographic, geographic and political variables and was weighted so that the sample corresponds as closely as possible the structure of the voting population. In a comment on the referendum former US Congessman and Presidential candidate, the pro-gold Ron Paul says that Switzerland is ruled by a group of elites who are more concerned with their own status, well-being, and international reputation than with the good of the country. The gold referendum, if it is successful, would be a slap in the face to those elites. Meanwhile Swiss fund manager Egon von Greyerz, whose views would put him naturally into the Yes camp, commented in an interview on King World News that the Swiss government is against this initiative, like all governments are, because it takes away from them their ability to manipulate the currency and gold markets. He goes on to say that the government continues to argue that gold is not good for the country. He noted that the Swiss Finance Minister called gold ‘A risky asset,’ and therefore not be held by Switzerland. However he goes on to make the point that in his view she is totally wrong because it’s the Swiss franc that is risky, not gold. The Swiss franc has already fallen 50 percent against gold, he said, in just the last 15 years, and it’s gone down 90 percent against gold since 1914. As a hard money Austrian school of economics adherent, von Greyerz reckons that, given the retention of the status quo if the No vote prevails, this will remain the case because governments always print unlimited amounts of money. He says that Switzerland has printed more than any other country in the world on a relative basis since 2008 - 400 billion Swiss francs in order to buy risky euro assets and other foreign currency assets in order to keep the Swiss franc low. In von Greyerz’s view Switzerland has always prospered by having a strong currency, low inflation, and a strong economy. The Swiss have pegged the Swiss franc to the euro and the very weak economic zone that is Europe. This is a recipe for disaster he feels. To align the Swiss people to a failed political experiment like the EU can only lead to a catastrophic outcome. So here we have the ‘for and against’ arguments. Should the Yes vote win and the result be thus enshrined in the Swiss Constitution, there would be a likely strong positive impact on the gold price, although perhaps not as strong as some might suggest given that it could then take a couple of years to become law and the eventual gold purchase programme could take a further few years and thus have only a relatively small impact on global gold demand as it is doubtful the SNB would act quickly on this given its opposing views. The chances of the Yes vote are perhaps stronger than initially envisaged. The Swiss are for the most part a conservative people and have gold imbued into their culture. The arguments to maintain the status quo are largely abstruse economic ones, while the Yes campaign will be a more emotive one which could well appeal more to the public. There is thus a good chance that the Swiss people will indeed, as Ron Paul says, vote for a slap in the face of the country’s elites, but don’t necessarily expect a Yes vote, should it arise, to provide anything more than a knee-jerk reaction in the gold price.. Global exploration for nonferrous metals has fallen sharply again this year – by 25% according to data collected by SNL Metals & Minerals. The mining cycle downturn is in full swing now, just preparing the ground for big price increases when the cycle turns given that current fall-offs in capital spending and exploration are bound to result in serious metals supply shortages, and correspondingly much higher prices when these shortages develop. Sure, there may be a global recession but this tends to mean slower, not negative, growth rates for the most part. Given that mining is an industry dependent on replacing ever-depleting assets as orebodies are worked out and grades decline then these fall-offs in asset replacement expenditures mean serious supply problems down the road. 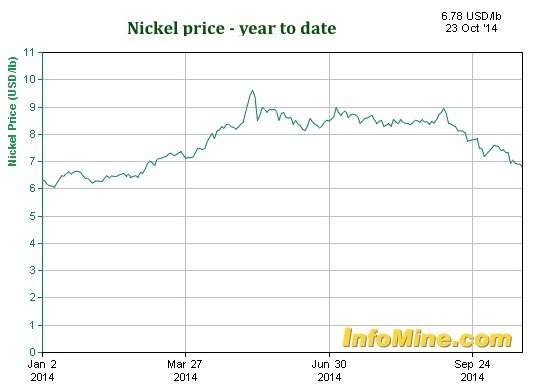 The graph below from acquisitive research giant SNL whose Metals & Mining division has, in recent years, absorbed both Canada’s Metals Economics Group and Australia’s Intierra (and with the latter Sweden’s Raw Materials Group) gives a pretty clear picture as to what has been happening in the key nonferrous metals exploration sector. After peaking in 2012, exploration expenditures have been declining rapidly and look to be heading down possibly to a ten year low point should the trend continue - and with no succour seen ahead for the junior exploration sector which, in the past, has provided up to 50% or more of the global exploration spend, then the sharp fall seems likely to continue. In data compiled for SNL’s forthcoming "Corporate Exploration Strategies" study, the group estimates the worldwide total budget for nonferrous metals exploration as having dropped to US$11.36 billion in the current year from $15.19 billion in 2013 — a 25% decrease. And 2013 had seen an even bigger percentage fall from the record 2012 level. The SNL nonferrous exploration category refers to expenditures related to precious and base metals, diamonds, uranium and some industrial minerals; it specifically excludes iron ore, aluminium and coal. SNL notes that calls for mining companies to improve profit margins in the face of rising costs and falling grades has led to the industry’s major miners divesting noncore assets and cutting back on capital project and exploration spending. This has led to a 25% drop in the majors' exploration budget total alone this year. Meanwhile the junior sector has been faring even worse as exploration focused companies battle to stay afloat in the light of rock bottom share prices and, as a group, have been reining in spending in order to conserve funds. SNL puts the fall-off in junior total exploration spending as being 29% year over year in 2014 after falling 39% in 2013, dropping their share of the overall budget total to 32% from a high of 55% in 2007. 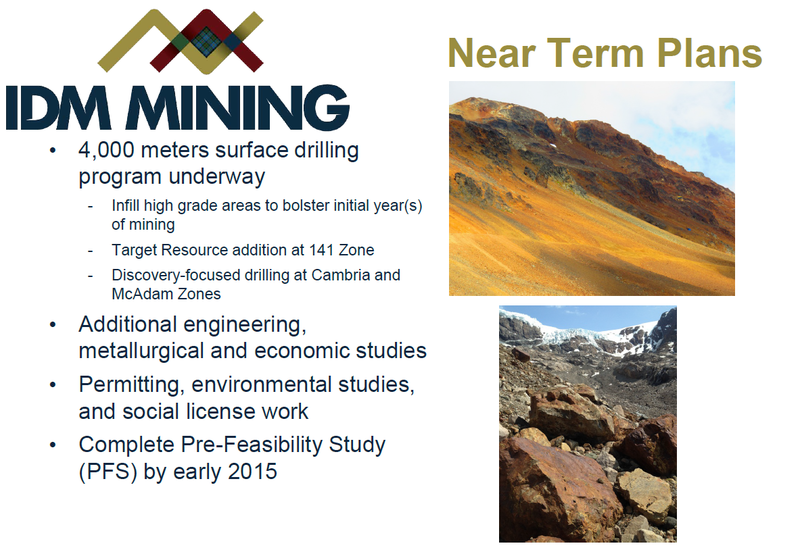 And for operating miners in particular it is noticeable that the pattern of exploration has been altering with a concentration on ‘mine site’ exploration following the old adage that the best place to look for new mineral deposits is adjacent to existing ones. Thus brownfield expenditure has been far more prevalent in the exploration mix as this is seen as a less costly way of replacing and adding reserves. But it does tend to preclude the finding of additional mega deposits which the industry needs to maintain output into the future. Gold has always tended to be the most significant nonferrous metal as far as exploration is concerned and there are always far more gold exploration juniors than base metals ones. But three years of declining gold prices have taken their toll and the proportion of gold exploration expenditure, while still the largest sector, has declined by 31% year on year to 43% while the collective share of base metals in the mix has actually seen a 2% increase although total base metals expenditure has fallen overall by around $1 billion. SNL concludes a release on the latest findings with the comment, “This reduced focus on early stage and generative work has led to concern that many companies, and perhaps the industry in general, are sacrificing long-term project pipelines in favour of consolidation and maximising returns.” But this has always been the case with mining accounting for the industry’s ever repeating cyclical profit pattern..
"All in all, there is strong demand for precious metals currently in China, though the mainstream media might tell you different.."
Blue is weekly withdrawals in Kg’s, green is year to date withdrawals in Kg’s. Because the SGE still isn’t disclosing withdrawal numbers from mainland and FTZ vaults separately we have to subtract the volume traded on the Shanghai International Gold Exchange (SGEI), located in the FTZ, from total withdrawal numbers, just in case all buyers on the SGEI opted for withdrawal, to come to the amount of withdrawals in the mainland (which equals Chinese wholesale demand). Although it’s highly unlikely all SGEI traded volume is withdrawn from the vaults, for the time being I’m forced to choose understating mainland withdrawal numbers rather than overstating. After subtracting SGEI volume from total withdrawals numbers, withdrawals from the mainland vaults (= Chinese wholesale demand) can not have been less than 66.91 tonnes. Year to date withdrawals can not have been less than 1492.59 tonnes. According to my simplified equation to calculate Chinese gold import (import = SGE withdrawals – mine – scrap), China has imported 957 tonnes year to date. Domestic mining stands at 356 tonnes (based on an estimated total of 451 tonnes for 2014) and scrap stands at 181 tonnes (based on 229 tonnes recycled gold in 2013). Shanghai silver remains scarce, on the Shanghai Futures Exchange (SHFE) silver has been trading in backwardation Since august 6. The scarcity has diminished the discount of silver in China relative to London significantly. Throughout October the discount was lower than 4 %. If the discount of the pure price of silver in Shanghai reaches zero and becomes a premium, demand for silver on the world market will increase as the Chinese will start importing silver bullion. (i) The cash costs for mining silver in China is significantly lower than elsewhere across the globe. For example Silvercorp can mine silver in the mainland for $9 an ounce. (ii) China’s economy is heavily dependent on copper and other base metals such as lead and zinc. By importing copper, lead and zinc concentrates that contain silver as a byproduct China is incidental importing silver. The reason the price difference is a not arbitraged is silver bullion export from the mainland enjoys 17 % VAT (no restitution). Which in affect is an export tariff of 17% to protect silver from leaving the mainland. Read: the State Council is protecting the Chinese silver market to offer their citizens to invest in silver below international prices. SHFE silver inventory has stabilized now all the metal that was brought into the warehouse to cash and carry silver (in times of a steep futures contango curve) has been depleted. Total SHFE silver inventory now stands at 94.807 tonnes. If we combine the last to charts we can see that whenever silver is trading in backwardation, inventory is dropping or stabilizing. If silver is not trading in backwardation (and the contango curve is steep enough), it can cause inventory to increase as the cash carry arbitrage opportunity arises (explained here). All in all, there is strong demand for precious metals currently in China, though the mainstream media might tell you different. Demand in China and India surged again and gold reserve diversification by the central bank of Russia hit a new record high in September as geopolitical tensions rose. The seemingly insatiable appetite of the growing Indian middle class for gold is causing the government in India to again consider imposing sanctions on the importing of gold. Gold imports into India in September were worth $3.8 billion. This figure is almost double the $2 billion spent by Indians in August as, once again, the Indian middle class, like their Chinese counterparts, used the opportunity of a weakened gold price to increase their holdings. This was particularly the case in recent weeks and in the run up to the Diwali festival which began yesterday with Dhanteras. To put this figure in context it is worth noting that in August 2013 gold imports were valued at just $739 million. Indian gold imports were up 449.7% y/y in September, which is approximately 94 tonnes, using the average gold price for September. From the point of view of the government in India, this level of demand for the precious metal, which must be imported, is an unwelcome development. "The trade deficit worsened to an 18-month high of $14 billion in September following a 450% rise in gold imports as importers rushed to take advantage of lower prices" reports India's Economic Times. The government in India claims that this staggering level of demand is causing a weakening of the rupee which undermines India's ability to import the other commodities upon which it depends. Exactly how the Indian government intend to deal with the problem is unclear. The previous attempt to control gold imports in 2013 was aborted due to it's deep unpopularity and to the fact that vast quantities continued to be smuggled into India regardless, resulting in loss of revenue to the state. In China, gold imports have surged again. In the world’s largest gold buyer China, premiums recovered to $2-$3 an ounce from $1-$2 overnight, showing higher demand and lending support to global prices. 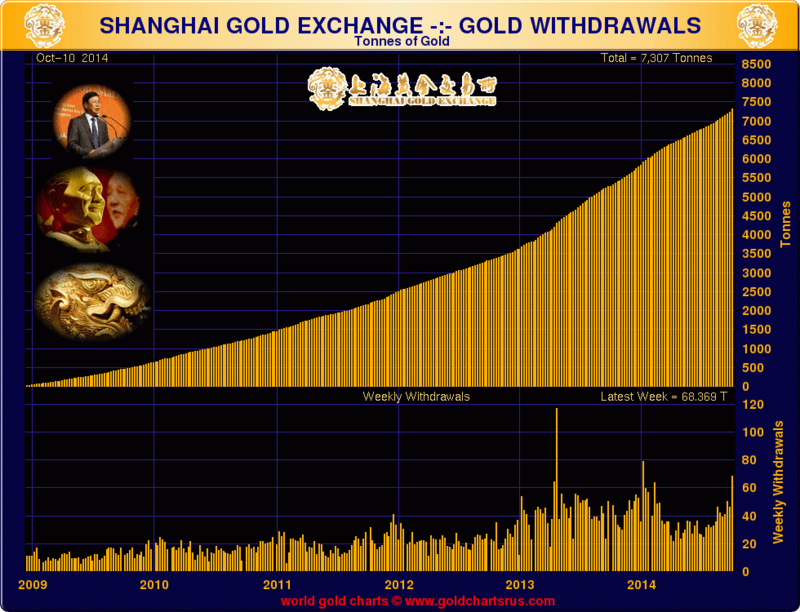 Shanghai Gold Exchange (SGE) gold withdrawals were very high this week and saw a huge rise for the week to 68.4 tonnes with most of the buying after their Golden Week holiday. Last year alone, China imported almost 2,000 tonnes of gold as seen in the important metric that is withdrawals from the SGE. To put that figure in context, global mining supply will be around 2,700 tonnes this year. What we in the West need to appreciate is that - in the case of both India and China, where around one third of the population of the Earth reside, - it is masses of individuals, families and local businesses who are driving this demand. It is being driven particularly by the burgeoning middle classes who are accumulating whatever gold they can with their disposable income. The desire to own gold as savings and financial security is culturally embedded in these ancient cultures. Asians experience of fiat, paper currencies has not been a good one. As such, the demand is not speculative and a cyclical, short term blip. Rather, it would appear to be a long term, structural shift to higher demand. While the trend may dissipate it is very unlikely to reverse into a trend of mass selling and it is unlikely to reverse trend anytime soon given the fiscal and monetary challenges facing the Western and indeed the Eastern world. Apart from massive store of wealth demand in the East, the gold reserve demand by many large, creditor nation central banks continues unabated. 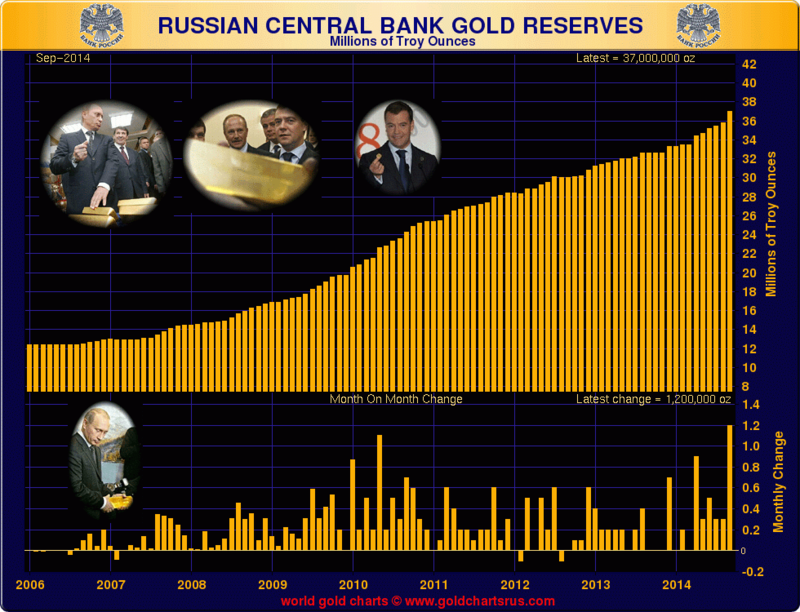 In Russia, the central bank added a very large 37.3 tonnes of the metal to it's reserves in September - it's largest purchase in fifteen years. It is an indication of the strategic importance that Vladimir Putin and his government place on gold that such a large amount was purchased at this time of international tensions. The rouble has been under tremendous pressure due to Western imposed sanctions and the slump in oil prices - Russia's largest revenue source. According to the Russian Central Bank: "In the past ten days we have sold about $6 billion" to support the rouble rate, Reuters reported yesterday. And yet $1.5 billion was made available to acquire gold reserves. Asian people are acting like their own central bank and diversifying their wealth. It is safe to say that - in the event of a global monetary crisis brought on by a tsunami of insurmountable QE compounded debt - the average Indian or Chinese family will be reasonably well equipped to weather the financial and monetary storm. The same cannot be said, unfortunately, for their Western counterparts where ownership of tangible assets is abysmally low and only a tiny fraction of the population own gold and silver bullion. Today’s AM fix was USD 1,246.75, EUR 982.08 and GBP 777.66 per ounce. Yesterday’s AM fix was USD 1,251.75, EUR 978.85 and GBP 774.17 per ounce. Gold in Swiss storage or for immediate delivery lost 0.2% to $1,246.08 an ounce by 1200 in Zurich. Silver for immediate delivery lost 0.7% to $17.43 an ounce. Platinum fell 0.5% to $1,276 an ounce. Palladium was 0.4% lower at $776 an ounce. Gold retreated from the highest in almost six weeks in dollar terms due to profit taking and renewed risk appetite which saw stocks globally bounce from their recent lows although european shares are showing weakness again this morning. Although gold continues to eke out small gains in euro, pound and other fiat currency terms. Gold reached $1,255.34 an ounce yesterday, the highest since September 10. 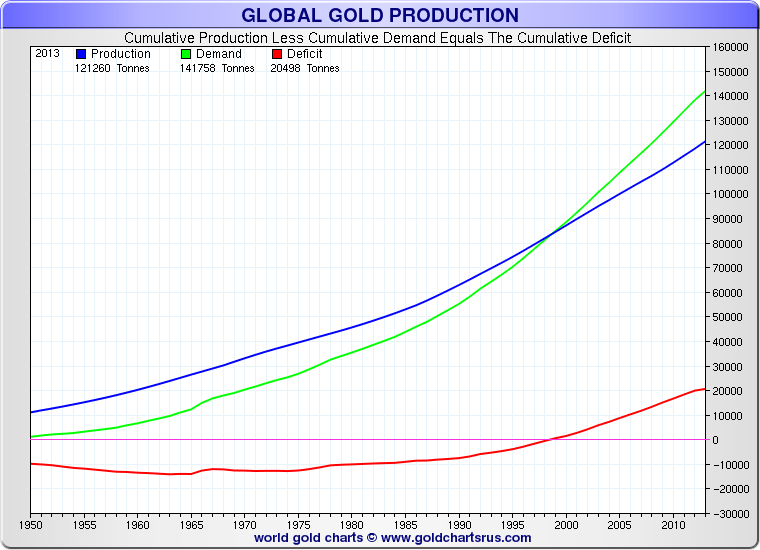 Demand in India, the second biggest gold buyer, surged before the Diwali festival, Indian’s Christmas. Diwali, the festival of lights is celebrated tomorrow and Dhanteras, the biggest gold buying festival, was celebrated yesterday. Dhanteras is considered an auspicious time to buy gold coins, bars and jewellery. Researcher CPM Group estimates the holiday generates about 20% of India’s annual purchases. Gold has risen 3.2% so far in October as stocks fell sharply and traders pushed back estimates for when the Federal Reserve might raise U.S. interest rates from near 0%. The IMF has cut its economic growth outlook this month and Fed policy makers said slowing foreign economies were a risk to U.S. expansion. Indeed, the U.S. economy itself looks very vulnerable to a recession. The Shanghai Gold Exchange is working to implement China's first forwards and options in gold, in a race to put China as the main Asian pricing benchmark that could rival the London gold fix. The European Central Bank is planning to buy corporate bonds on the secondary market and may decide as soon as December with a view to begin purchases in early 2015. This is another sign of desperation on the part of central bankers who are attempting to kick start the structurally broken Eurozone economy. A diversified portfolio of precious metal coins and bars, owned in a segregated and allocated manner in the safest jurisdictions in the world remains very prudent. See Essential Guide to Storing Gold In Switzerland here. Nach vielen Spekulationen wurde es gestern offiziell bestätigt. Die Lundin Mining Group übernimmt durch den Shell von Fortress Minerals das tief gefallene Fruta del Norte Goldprojekt in Ecuador, das Major Kinross Gold durch die einstige Übernahme von Aurelian Resources erworben hatte. Gleichzeitig gründet die renommierte Lundin Group eine neue Goldfirma (Lundin Gold). Ein auf vielen Ebenen sehr interessanter Deal. Kinross Gold schließt damit ein ernüchterndes und sehr kostspieliges Firmenkapitel..
Fruta del Norte, discovered in 2006, is one of the world’s biggest gold discoveries, containing about 6.7 million ounces of proven and probable gold reserves and 9 million ounces of proven and probable silver reserves. Fortress Minerals is purchasing a 100% interest in the troubled Fruta del Norte gold project from Kinross Gold (NYSE:KGC) for US$240 million. Reports surfaced in May that Kinross, which took a $720 million write-down when it halted its $1.3bn Fruta del Norte gold-silver project in Ecuador last year, was looking for a buyer to recover part of its investment. Fortress Mineals says it plans a brokered placement to raise the $250 million for the Fruta del Norte acquisition and capitalize a new company entity. Fortress Minerals, which is part of the Lundin group of companies, will change its name to Lundin Gold Inc. 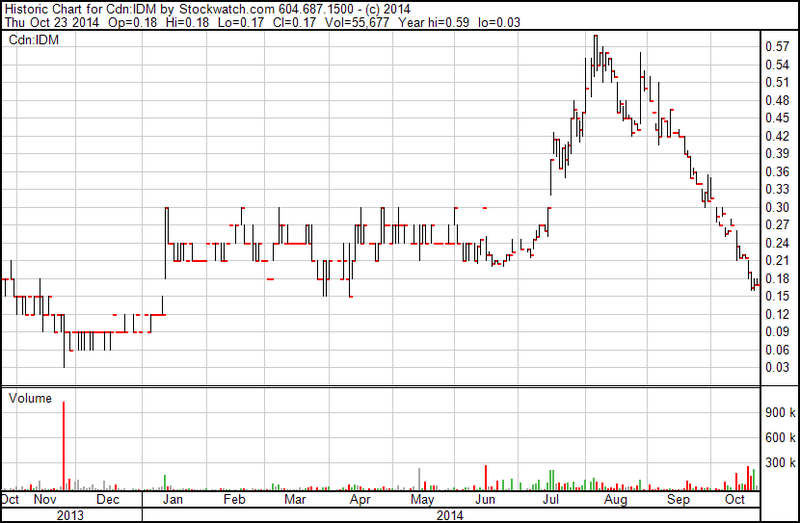 In a press release, Fortress Minerals said the new company will become a ". . . gold vehicle of the companies controlled by the Lundin family, with FDN being the flagship asset upon which it will build its gold business." Fortress says the Government of Ecuador supports for the transaction. 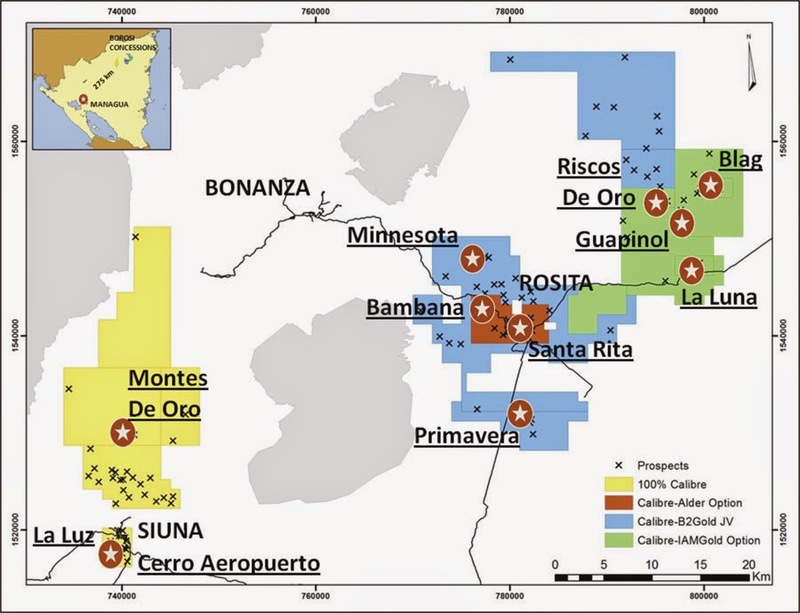 "[Fruta del Norte] is one of the most significant gold discoveries in the last 15 years and we believe tremendous value can be generated through its development," said Lukas Lundin, President, CEO & Director of Fortress commented in a statement. "The value created will benefit not only Fortress shareholders but also the Government and people of Ecuador, who are our most important partners in the project. "Our team is very enthusiastic about working on FDN and we are confident in our ability to rapidly advance the project to a construction decision and obtain the required permits to build this world-class gold asset. This acquisition is the first step in the building of our gold company, Lundin Gold, to carry on our previous successes in the gold industry which included the Alumbrera and Veladero gold deposit discoveries in Argentina in the 1990s." We update figures for the world’s top silver producing companies and countries and see rising production this year but flat to declining output ahead. 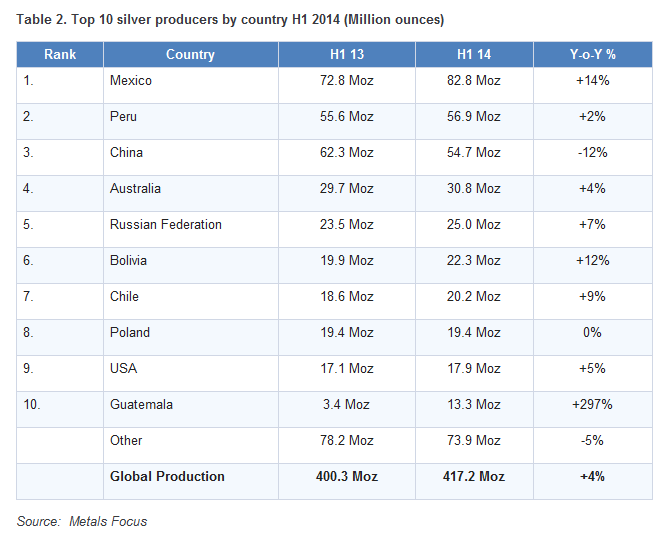 While it has always been relatively easy to collate the world’s top 10 gold miners because they are all primary producers (see: Barrick only top gold miner to see output fall in H1 2014), to do the same for silver is not nearly such an easy task as most of the world’s silver is produced as a by- or co-product of gold and base metals mining. 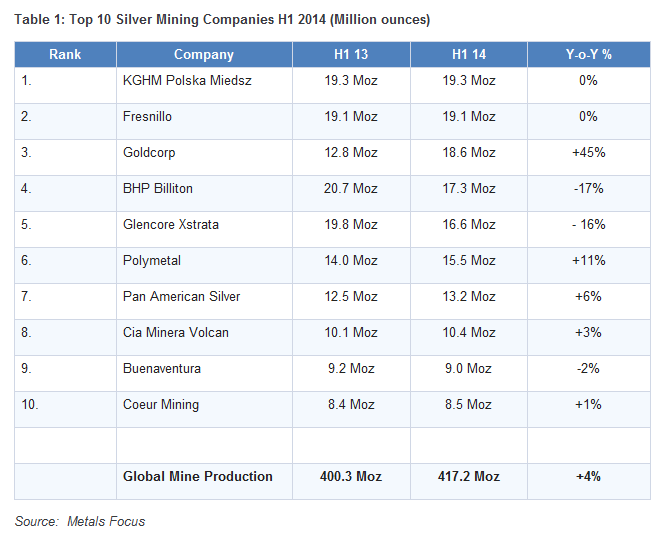 Thus in the table of the top 10 global silver producers shown below only four could be classified as primary silver miners – and virtually all those will, in any case, also be producing other metals – notably gold, lead and zinc – as very significant by products without which they would perhaps not be profitable mining companies..
Calibre Mining (TSX-V:CRB) gibt heute weitere postive News bekannt. 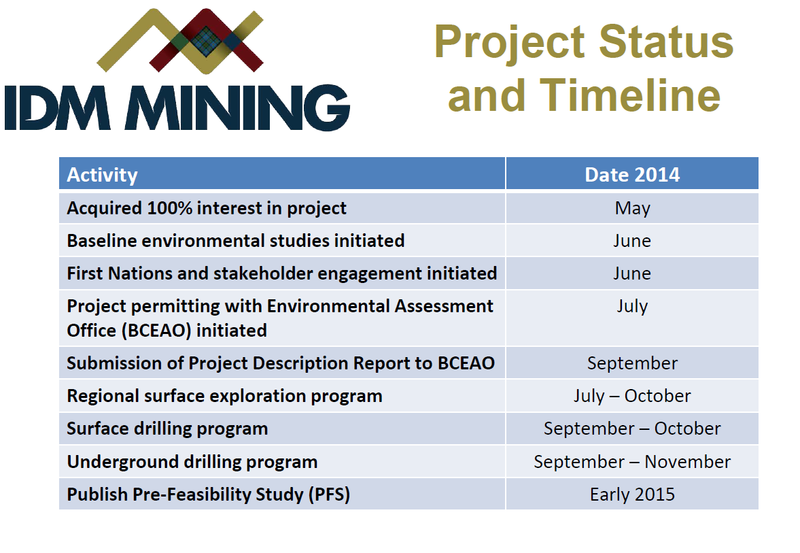 Das mit Spannung erwartete Diamanten-Bohrprogramm auf dem Minnesota-Goldprojekt wurde zusammen mit dem Projekt-Partner B2Gold (TSX:BTO) gestartet. Ein kurzer Überblick der jüngsten Explorations-Highlights und ein Ausblick auf den anstehenden Newsflow. 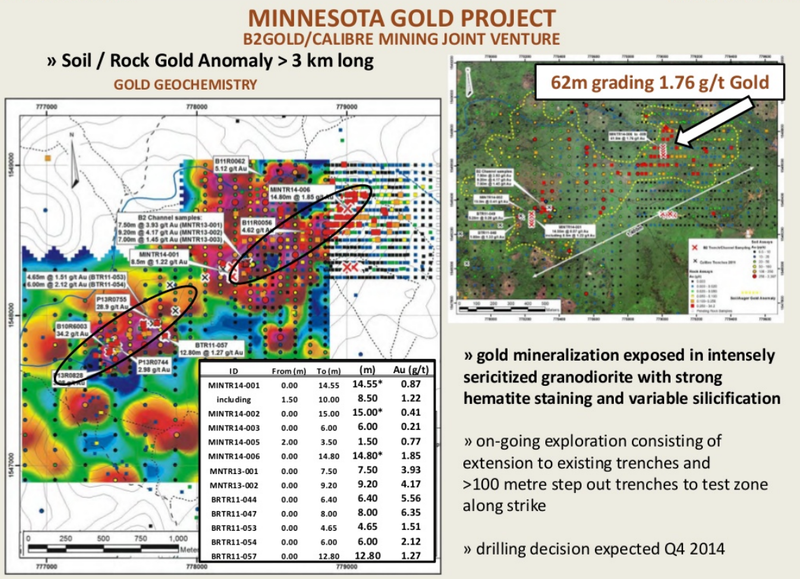 Recent trenching on the northern area of the Minnesota gold target intersected 93.5 metres grading 1.65 g/t gold in an altered intrusive and the zone is open in both directions. Das Vertrauen der Investoren in die Goldminenbranche fällt zusammen mit dem Sentiment auf neue Jahrestiefstände. Die jüngste Erholung des Goldpreises (GLD) kann die Talfahrt bei den Goldminen (siehe HUI, XAU, GDX) bis dato nicht stoppen. Der Markt preist somit bei den Goldminen schon einen weiteren Kursverfall von Gold Richtung 1.050 USD/Unze aktuell ein. Das Überraschungspotential liegt dadurch klar auf der oberen Seite (Sentiment auf depressivem Niveau), aber nur solange Gold die kritische Dreifach-Unterstützung bei ca. 1.180 USD/Oz nachhaltig verteidigen kann. Und daran glauben die Anleger in der Goldminenbranche zurzeit nicht.